When it comes to communication purpose, Instead of SMS usage number of people switched to focus on it for communication purpose. It is the application where you can send not only the text but also video, audio and documents in a single tap. The usage of this application is also very much convenient and simple for the users. Moreover, it is absolutely free for the user to download and install on their device. However, when it comes to download this application, we can use to some extent but still a lot of users seeking for more features to use. Despite immense popularity, this application’s users are still in need of more features to experience on their device. So, to go beyond the restrictions, the developers are focused on it to develop the tweaked app of WhatsApp called Watusi. It is one of the best-modified apps where you can get more features and use it for the communicating purpose. The major highlight of this tweak application is you can efficiently use it beyond the restrictions. If you are looking for this app to download, then you can download it at free of cost. When it comes to WhatsApp Watusi installation process, you need not jailbreak your device. We all know that most of the applications are requested to jailbreak their device during the process of installation. With this tweaked version, you can get a fantastic experience of usage during every conversation. As per the sources, the developer of this tweaked app is still focusing it on the new features to bring in future. If you are really excited about download this application on your iOS 11 device, then you need to follow some of the steps to complete the installation process. If you are ready to download and install on your device, then knowing about the elements will always help you for the future. Here we are providing some of the exciting features to check out before going to download. With the help of Watusi, you can hide specific button whenever you want. Usually, we used to hold the recording button to record and send it in the original But when it comes to Watusi, you can just tap the button to start recording and tap to stop the record. All you just no need to hold it further for recording anymore. You can easily protect the WhatsApp conversations with the help of passcode of Touch ID at any time. The major highlighted feature of this application is you can record incoming or outgoing calls in WhatsApp in just a single tap. The user can easily disable the indicator when some are replying to your text it will show like “typing….” It is possible with this application at any time. For your information, the user can easily lock his/her last seen timestamp without any hassles. While using Watusi, you can disable the double tick delivery indication. You can also change your font color and size according to your convenience. These are considered to be the best features of this application. Also, it will lead the users to experience the real fun with this tweak app. Do Check this article, if you are already a cydia impactor user, ‘Fix* Cydia Impactor.Exe has stopped working error on Windows PC‘. Additional Features available: When you started to use this tweak application on your iOS device, then you will able to see some additional features like customisation. By using that custoSization feature, you can easily modify as per your need. Hopefully, it will help you to get some fantastic experience while using on your device. It is all possible in the application without doing any jailbreak on your device. Generally, when it comes to tweaked apps, most of the people will get struggle to know about the steps to follow for the installation process. For those people who all are looking for this application to install on your device, here you can find the steps to proceed further. 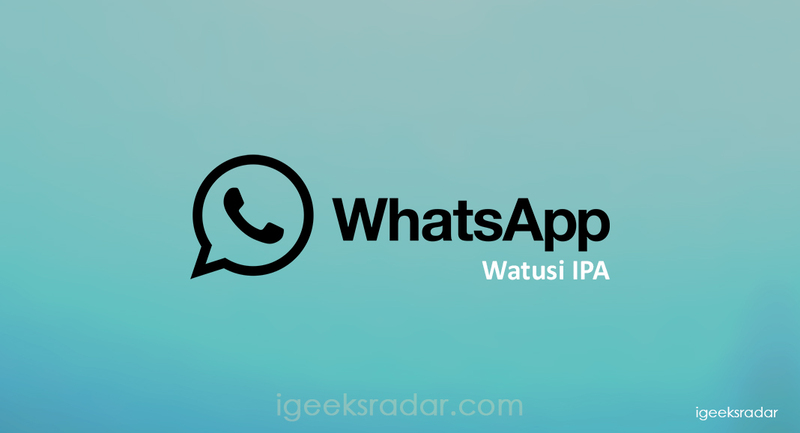 At first, it is essential for you to download WhatsApp watuui on any no jailbreak device. Now, make sure to install Cydia impactor without any errors. All you just need to connect your iPhone to PC with the help of USB cable. Now, you can open the Cydia impactor, and it is essential for you to check whether the device is connected successfully or not. After the above process is done, you should drag the IPA file of WhatsApp Watusi and drop it on Cydia impactor. By following the above process, you see one pop-up which will ask for you to enter Apple ID and password. Now, follow the instructions by entering your ID and start the installation process. Wait for few seconds until the installation process is completed. Once it is done, you can now get back to home screen to find this tweak app to use. Download Cydia Eraser for iOS 12, iOS 11 and iOS 10+ iPhone/iPad 2018. Installous: Install Paid Apps for Free on iOS(iPhone/iPad) Without Jailbreak. If you are a user of WhatsApp who is looking for various features, then this tweak application is the best choice to download on your device. Moreover, to install this app, you do not require any jailbreaking on your device. However, we can also expect some new more features in the next update.